Hey - I just noticed that my last post was number 500! That makes this number 501, like the Levi's jeans I've never had a pair of! Well. After spending all day wishing I could convince Jason to let me order a Vera Bradley knockoff bag from QVC, I went and weighed in. Full of fear and trembling. And apparently, trembling burns lots of calories, because I lost a pound - 147, 90 pounds lost, nearly back to my all-time low of 146.5. And my buddy who made me the mix CD? She's a pound and a half from 100 lost! I'm so proud of her - and not a bit miffed that she's going to beat me there. Please send some good prayers and vibes my way, though - tomorrow I'll be working on our magazine! I'd hoped to have it finished so that I could enjoy the long weekend, but it looks like one of the ads won't be ready until next week. As it stands, I'm going to delegate some of the work to two of the other girls in the office, and maybe betwixt the three of us, we can get most of this monstrosity knocked out. 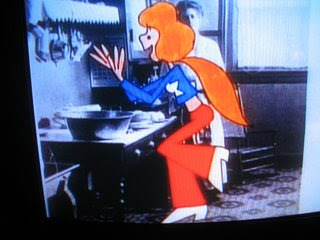 Just the other night, I came back from a Walmart run to see Anna Marie had pulled out some of my old Schoolhouse Rock videos. And one of the segments was "Suffering until Suffrage." And I had to explain to her what the song was about. And then today, I get a text message from Amanda (the sister, not one of the two sisters-in-law) wishing me a happy 88th anniversary of the right to vote! I love to vote. I didn't start until after I graduated college, because I moved 500 miles from home a week after I turned 18 and knew I wouldn't get home often enough to do so. But now - oh boy, now I'm a voting machine! In South Carolina, where I first registered, we had to declare a party affiliation. But in Mississippi - well, it's a free-for-all. No ID? No problem! Heck, if I wasn't so well known in the community, I could probably go vote under my sister's name since she moved to Memphis. And that free-for-all means that I can vote in the primaries of the other party! And I do! Not for sabotage, mind you, but just because I know that voter turnout is so abysmal that any little bit helps. And on the subject of voter ID - I happen to think that opposition to such measures is just ridiculous. Have you seen the bill that didn't pass in our state? (You don't live here. Of course you haven't.) It wasn't just a driver's license that would be acceptable - you could bring a birth certificate, or a Social Security card, or probably even your Kroger Plus Card. And if you had none of those, the state would issue you an ID for free! No one who operates in polite society today would be left out! So, ladies, congratulations on being able to vote. And if you don't, shame on you! Lots of people worked really hard to get you that vote! Even if you can't get excited about the issues in an election, you owe it to yourself, and that star-spangled girl from Schoolhouse Rock to cast your ballot. I just could not come up with a snappy title for this post. Let me tell you what it's about, and then maybe you can help me. That's what we do around our office when we need a headline and we're stumped. 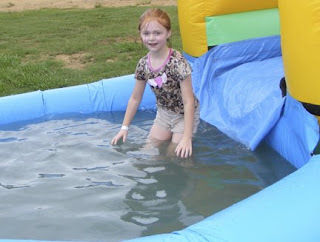 This entry is about taking Anna Marie to the fair on Saturday. I did not want to go. I'll admit it. I was happy that it wasn't over 100 degrees like it was last year, but it was raining. And I was tired. And I had other things to get accomplished on Saturday, and if I wasn't taking pictures for the paper, I probably wouldn't have even gone. But I did. We did. Anna Marie and I. Admission was only $2 each, and I bought Anna Marie a "fun pass" that entitled her to play on 7 or 8 blow-up thingies (moon bounces, etc.) as much as she wanted for another $3. So that's what we did. Mom gave her $5 to buy a snack (as a bribe for her to eat breakfast?) but more on that later. 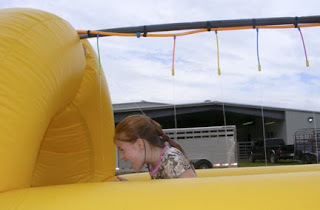 Anna Marie spent most of her time on those inflatable things, which were under one end of the arena where the fair was held, while I took pictures. 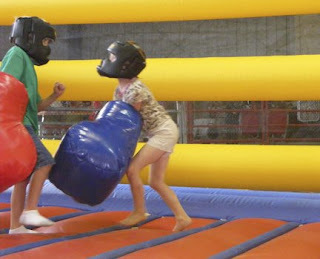 One of the things she did while I was around - boxed some random kid. I can hear her now, getting all up in his grill. Yeah, that's what I thought. Punk. There was a film crew from Sweden there, doing a documentary about Southern food. 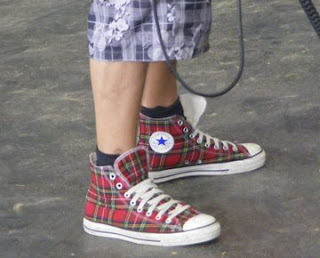 I knew they were European because no one down here wears shoes this cool. And what would a county fair be without livestock? 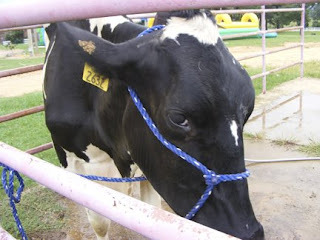 This cow was headed for a milking contest. The poor girls looked like they hadn't been milked in several days. Ok, so that part about all the inflatables being in one place, inside? Not completely true - there were several waterslides outside, and I promised we could do those last. Yeah, that water was as nasty as it looks onscreen. So, about the snack - we settled on some nachos and a shaved ice. Which took up not only the fiver mom gave her, but a dollar of mine as well! But the worst part was that as we were sitting inside the arena, so she could eat on the bleachers, I knocked over the shaved ice! None of it got on her, but she cried real tears about it. I felt badly, too, because I didn't have enough cash left to get her another. Luckily, the cow milking contest started, and she was distracted for a while. Nothing like observing a little hard farm labor to fascinate a little red-haired city girl. Ok, so I didn't go weigh in tonight. I know! It's awful! I'll give you a minute to return your pulse rate to normal. Tonight was Anna Marie's open house at school, and it started at 6:00 p.m.
Technically, weigh-in is supposed to begin at 6:00 p.m., but the ladies are usually there about 5:30 p.m. But, every time I try to weigh in and leave to get somewhere early, I run into some kind of snag - they're late, or there's someone who needs a lot of special attention, or something. Plus, I don't like to eat before I weigh in (because, let's face it, I still have plenty of fat to show up on the scale, without adding dinner) and it wouldn't have given me time to eat before open house. So I'd just now be getting dinner. And now is when I have to go put Little AM to bed. And so it goes - my first time to willfully (meaning not out of town) play hooky from weigh in. Don't worry - I'll be back in there next week! Ever have one of those kinds of days? The kind when you have something REALLY important and REALLY pressing to get finished, and you're on a deadline, but yet the whole world is calling/emailing/visiting you? I had an early meeting to cover, and then a staff meeting waiting on me when I got back to the office. Afterward, I worked for about two hours on the special edition that was due today before stopping for lunch. 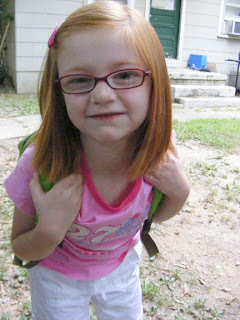 An hour after I got back for lunch, it was time to go get Anna Marie from school. Of course, it's pretty difficult to work when you've got that six-year-old asking you to sharpen her pencil so she can do her homework, when she can darn well sharpen that pencil herself. Phone call after phone call. Email after email. I thought I was never going to get done. When I finally did get up from my desk for a minute, to retrieve some papers from the printer, there stood one of my Weight Watchers buddies! She and I are neck-in-neck to see who can get to 100 lbs. lost first. I think we're tied right now. I'd seen her last week on my way out, as she was on her way in, and we talked about how stressful our lives had become lately and how hard it was to deal with it all without constantly raiding the fridge. She'd really been on my mind the last few days, so I'd been praying for her situation - and apparently, I was on her mind too. "I came to see you," she said. "You've been on my heart." And she handed me a CD she'd burned. It was a mix tape! Well, a mix CD. She has a very long commute to work each day, and has some songs she listens to in an attempt to keep herself positive and keep her spirits up. And she made me a CD of some of those songs! I was so touched! And just when I didn't think I could do with even one more interruption, I got one that I just couldn't do without. And now every time I listen to those songs, I'll think of my friend, thank God for her, and send a little prayer her way. Thank God for those kinds of interruptions! What you should be doing all weekend. I've got to quit letting this blogging thing get behind - both my reading others, and my posting - because then it ends up taking more time than I have to spend. Not that you guys aren't totally worth it. I'm just sayin'. So, here's a bit of randomness from my weekend. * It's official. My coffee maker's built-in grinder is finished. I do have some ground coffee (mocha - yum!) but I also have a box of beans that must not go to waste! Since I can't afford either a coffee grinder, or a whole new set up, right now, I'll have to get creative. Like, borrowing the coffee grinder which sits in our kitchen at work and grinding all the beans at once. Not the best solution, but the only one I can think of that won't cost several days' wages. I do intend to save up for another all-in-one unit, though, because I like the convenience of putting the beans in when I load up the machine the night before and having the whole operation running when I get up. * Speaking of getting up, I'm afraid that if I want to work exercise into my morning - and it clearly isn't working to work it in at night - I'm going to have to rise another half hour early during the week. 5:30 a.m., here I come. * Between Jason (accidentally) hitting me in the nose with the cabinet door on Saturday night, and Anna Marie (accidentally) hitting me in the nose with her fist tonight when I was trying to help her get settled down in bed, I'll soon be in need of a new nose to go along with my new coffee maker. If I didn't develop a bruise from Saturday's altercation, a nice one should show up from tonight. And now I'm also developing a headache from the blow. * I could really use a few prayers/good vibes right now, because I've got two big projects - our football special edition, and our magazine - that have to be finished in the next two weeks. And early deadlines next week because of the holiday. And my normal work. Oh, yeah, and after that, a probable murder trial. So, yeah, I'm just a wee bit stressed right now. Breaking down in tears (when coupling these factors with some other current stressful situations, none of which I have any power to change right now) is not an uncommon occurrance in my life right now. Hopefully, tomorrow I'll be able to slip away at lunch and attend my book club meeting, which I haven't been able to do in a couple of months because of prior commitments. Hope everyone else is having a better day than I am! Warning: there is NO telling what I'm about to type, because I just took two Excedrin PM. Read at your own risk. After one heck of a day - the coffee grinder part of my machine isn't fulfilling it's God-given purpose, grinding coffee; I attended a luncheon meeting with a bunch of other newspaper folks, and then almost forgot to go take two pictures when I got back; something went awry with the van when Jason was getting Anna Marie from school and I had to go pick them up - I stumbled my way into the church gym where my Weight Watchers meeting is. Anyway - I lost 2.5 pounds of the 3.5 I gained last week, and am now back to 148 (89 pounds lost). By the way - if you're wondering how Anna Marie is doing in first grade - she got into trouble the first three days (for talking, of course) but has been doing better the past three. My sister suggested that since she was getting into trouble, we should take her out and let my dad homeschool her. But here's the best part - Amanda thinks the whole operation would make a great reality show! And I totally agree. 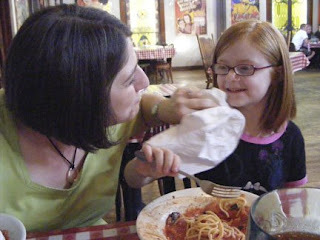 But when I was telling Jason during dinner tonight, Anna Marie was not convinced. "No!" she said. "He's a mechanic. He can teach other people to be mechanics." Now, my dad is prone to "sayings." One of his sayings is, "I don't play. I quit school on account of recess." And Anna Marie has apparently been paying attention to my dad's educational philosophy, because she continued with her reasons for not having her Papa homeschool her. "You don't think Papa would make a good teacher?" "He quit school at the time of recess." Those of you out in Blogland didn't know that this week, I've been wrestling with my own private coffee crisis. Saturday morning, I awoke to the realization that I was out of coffee pods for my beloved Senseo machine. And I was out of my Gevalia coffee for my tricked out grinder/coffee machine. And I was expecting a shipment of Gevalia at any moment so I didn't want to go buy more coffee. In other words, on Saturday morning I awoke to NO COFFEE! In less than a year, I have become a coffee fiend. So you'll imagine my delight when, after pawing through my kitchen cabinets, I emerged with a bag of ground coffee which Jason had been given at a food service trade show a few months back. Crisis averted! Or, so I thought. 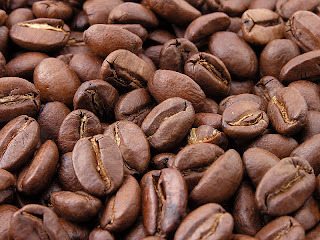 I have become a coffee fiend, it is true - unfortunately, thanks to my choice in coffee makers (the Senseo and the grinder which tells me with wee small marks how many beans to insert for my four cups) I have become a coffee fiend without knowing how to brew a cup of coffee. Go ahead. Point and laugh. So, I found the scoop that came with my coffee maker, and, trying to remember what I'd been told by Alton Brown, I scooped one scoop for each cup of coffee. The coffee was pretty good, even if it seemed to be a bit less than the machine should've made for the amount of water I poured in. Sunday, I repeated the procedure. I got a little less coffee in return this time. Monday, I got less coffee still. By now, I was getting a bit concerned. But Tuesday, oh, Tuesday was the worst - for the four cups of water I poured in, I got maybe a half-cup of coffee in return. Needless to say, I left my house yesterday sans coffee. I substituted a Coke Zero - Breakfast of Champions. My Gevalia came in yesterday morning (the Mail Guy brought it by my office, to save himself the trip of getting out of his truck at my house) and I was determined to figure out what was going on. At lunch, I prepared the coffee maker as usual, with the whole beans. I got about a half cup of coffee again. After I ate, I looked inside the coffee maker and saw a good bit of water left in the reservoir. Like any enterprising journalist, I unplugged the unit to investigate further. It poured. And it poured. And it poured. And I have NO idea where all this water was coming from! But at the bottom of the reservoir, I spied two rogue coffee beans, perhaps refugees from my loading the grinder while it was still in the unit. I decided to run water through the already-ground beans, because they didn't appear to have had very much run through them the first time. I got more coffee, but it took forever - like 30 minutes - to finish brewing. After dinner last night, I found a flashlight. At the bottom of the reservoir, in the drain, I thought I saw a coffee bean - perhaps an explanation for my water woes. I tried several different mechanisms for getting at the suspected bean - coffee stirrers linked together, a bendy straw, and, finally, a wire coat hanger with a paper clip attached at the end. What did I get? Big fat nothin'. Jason suggested that I take the machine to my dad, but my coffee addiction centers started screaming - "No! That'll take DAYS! I need my fix TOMORROW!" I decided to take my chances. Last night I loaded the unit up, set the timer for about 15 minutes before I was scheduled to get up, and held my breath. And this morning - success! I don't know what I did last night, but I had my coffee waiting on me when I stumbled into the kitchen! Now, I'll poll The Internets about the proper coffee-to-water ratio. I received some mocha coffee in yesterday's shipment, which is already ground, and I don't want to waste a drop. Because mail-order coffee is a terrible thing to waste. "He's a complicated man, and no one understands him but Tom Cruise"
"Who is the man, who was on TV yesterday talkin' bout Bernie Mac?" How unreal is that? Just Saturday, Isaac Hayes was on our local (Memphis) news stations talking about Bernie Mac, who had died that day. And then, Jason gets online yesterday and exclaims, "Isaac Hayes has died!" And then last night, we were at our small group meeting, and my phone (which I usually switch to silent at such events) rings, and it's my mom, asking if Isaac Hayes is really dead. Because when you pick up the tail end of a photo montage on a news cast, that's the first thing you assume, right? And living in this area, I'm pretty sure I'll have the theme to Shaft running through my head for like, the next week or so. Just like last year when I mused that it was completely awesome that James Brown, the Hardest Working Man in Show Business, had to work hard even after death - multiple funerals, multiple costume changes, and a several-month delay in being interred - I think that Isaac Hayes needs an equally-awesome sendoff. Like, they need to bury him in that get-up from the Oscars that year that the theme from Shaft was nominated - gold chains and all - in a solid-gold coffin. Maybe with a red-velvet interior, and some diamond-shaped windows. Over at 5 minutes for mom, they're hosting the Back to School Giveaway! Because the only thing better than free "stuff" is free "food." Go on over there, y'all! And I'm not even remotely Jewish. Y'all, I knew I'd not done my best eating this week, or maybe I have - because I gained precisely 3.5 pounds! Add that to the half pound I gained last week, and that makes four pounds in two weeks. And I'm not even pregnant, and even if I were, four pounds in two weeks would be a bit much. I blame Warehouse Wednesday. I never, ever have a good weigh-in after one of those. I also blame the apple pie and ice cream that was served at my office to celebrate the birthday of not only me, but also my office mate Amber. And I guess I also blame the little-to-no exercise I've gotten this week. I had it coming. I knew I did when I stepped on the scale. I just didn't know I had SO MUCH coming! Well, if you must know, this is what is going on today, but we shan't talk about it. Instead, we shall talk about yesterday, which, being my birthday, I took off from work. 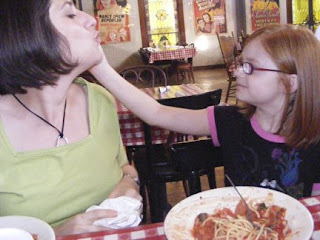 And, since Jason had to work, Little AM and I had a little mom-daughter time. We went to the auction for lunch, and, wouldn't you know it, I got pressed in to service - first as a cashier, and then on the serving line. Such is the pitfall of a family-owned business. I had promised Anna Marie we'd do something special, since it was my birthday, and it was the last day of summer break, so we went to the movies to see Space Chimps. Cute movie, lots of pop culture references, yada, yada, yada. 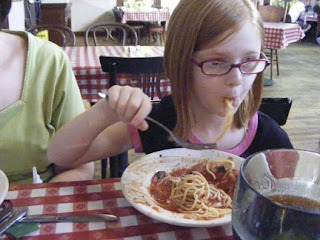 And then the main event - the obligatory dinner at Spaghetti Warehouse. 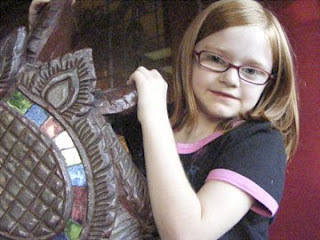 And the obligatory Anna Marie posing on the giant dragon carvings in the entry way. So, we won't talk about this morning - because some of us are still recovering, and have lots and lots of paperwork to fill out between now and tomorrow morning. Nope, we won't talk about it at all. Ok, so you've read about my not-so-excellent adventure of this morning. Later today, I read that Kelloggs was caving to consumer pressure being really nice and honoring the rebate on the purchases from Sunday! Sunday! When I bought more than enough qualifying products! I came home, found the receipt from Sunday (with the help of Jason) and that bad boy is already in an envelope, with the rebate form, stamped, and addressed. And tomorrow, it shall be bound for Battle Creek! Anna Marie and I have already said a word of prayer over the whole operation. But could you imagine if someone did make a musical of a sleepover? It would be awesome! And I could play the part of the Killjoy Chaparone, the one who has to get up and go to work the next day, and insists that her charges at least be quiet enough that she can get some rest. We had (as Anna Marie put it) SO much fun Wednesday night! 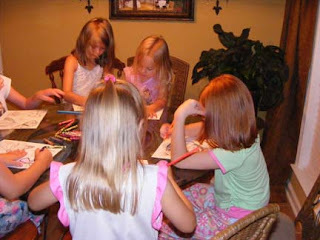 Two dozen girls under the age of 12 running around the house all night - what could be better? When I told someone about it the next day, they said, "I can just imagine all the giggling that went on." Oh, my, goodness. NO you couldn't. 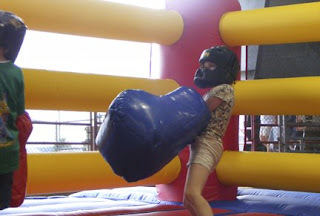 Because there was much giggling, and screaming, and general horseplay among the girls. There was lots of food out for us to nosh on, lots of healthy food - thank God, because I was grabbing a bite every time I walked through the kitchen. The church had ordered pizza, but it was an hour late getting there. Apparently, a problem on Domino's end, not ours. I did have a few bites of that as well. The girls were all advised to bring dress-up clothes and put on a fabulous fashion show. Anna Marie had picked out a white dress, and even though it was over her street clothes, she still complained that it was itchy. She took the dress off at the last moment, and when she came down the stairs, was just holding a pair of pom poms. Sorry it's sideways - it's pretty short, so you can just turn your head. You'll manage! 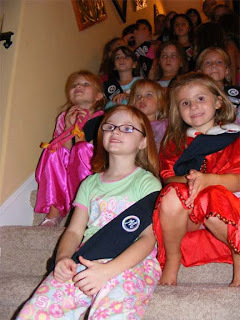 Later, the girls all gathered on the stairs and we got pictures of them with their sashes. Anna Marie doesn't have any badges yet, but she's pretty excited at the prospect! 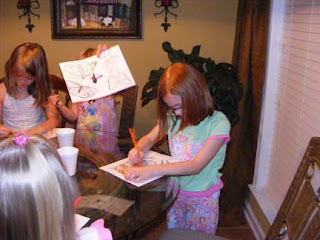 Much, much later (like, about 11 p.m.) there was a coloring contest. 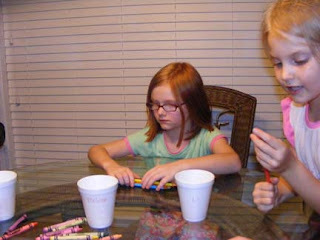 Anna Marie takes her coloring contests very seriously. We finally got the girls settled down about 1 a.m. I took the extra room the host had fixed for her granddaughter (and when I say fixed, this lady knows how to make a little girl's fantasy come to life!) and slept on the daybed. I ended up with two girls, neither of which was my own. She preferred to sleep downstairs with some of the other girls. There was another couple in the grandsons' room, and a slew of girls in the master bedroom upstairs. Unfortunately, one of the girls in my room was terrified of the dark, and we had to sleep with a lamp on. I managed - I've slept like that before, for instance, after watching Seven in college - and I got a few hours sleep before we had to leave and I had to get to work. 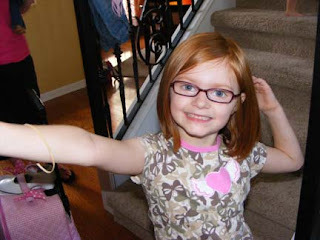 And, Anna Marie woke up the next morning, surprisingly bright-eyed and bushy tailed, but ready to get home nonetheless. Thankfully, Ms. Jeannie is a wise woman and had a pot of coffee ready first thing - God bless her! I've even agreed to be Ms. Jeannie's helper on Wednesday nights! She teaches the Prims (first and second grade girls) class, the one that Anna Marie will be moving in to, and she said she had 14 girls last week! By herself! How could I not help? Ok - let me tell you what Tracy, another mom said. We'd attended Cornerstone about six years ago, when Anna Marie was a toddler and we'd first moved to Mississippi - and I was 90 pounds heavier. Several people are still at the church that I remember, but I don't say much because I don't know if they recognize me. A few have, but I think they recognize Jason or Anna Marie first. Tracy and I were talking Wednesday night, and she asked how long we'd been at the church. I said, "Since around Easter." She started looking at me quizzically, asked if I'd gone there before. 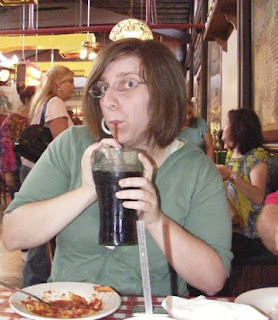 "Yes, about six years ago - but I was 90 pounds heavier and looked much different!" She said she thought she recognized me, around the eyes, and Anna Marie. She kept the nursery next to the one that Amanda and I had worked when we went there before. She said, "I thought I recogzined you, but how do you ask someone if they used to be a lot bigger?" She also remembered my mad fashion skillz - I used to be such a diva at church, and wore lots of scarves and such. It's amazing that even as my body has changed, my fashion style has changed, and I just don't feel the need to dress up that much anymore. We did have a good time - an exhausting good time! Hopefully the next time around, I'll be able to take the whole day off, and not have to go in on a deadline!